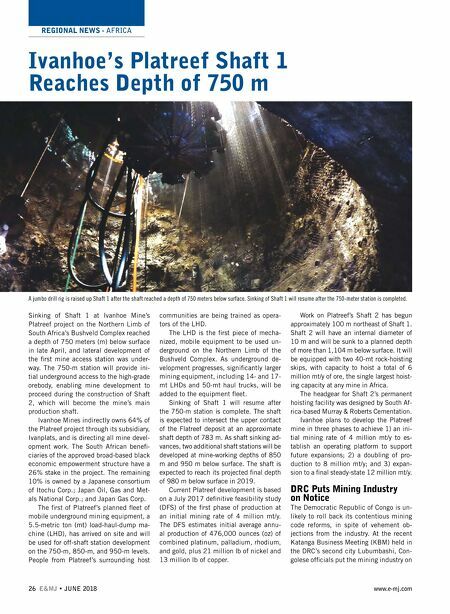 REGIONAL NEWS - AFRICA 26 E&MJ • JUNE 2018 www.e-mj.com Ivanhoe's Platreef Shaft 1 Reaches Depth of 750 m Sinking of Shaft 1 at Ivanhoe Mine's Platreef project on the Northern Limb of South Africa's Bushveld Complex reached a depth of 750 meters (m) below surface in late April, and lateral development of the first mine access station was under- way. The 750-m station will provide ini- tial underground access to the high-grade orebody, enabling mine development to proceed during the construction of Shaft 2, which will become the mine's main production shaft. Ivanhoe Mines indirectly owns 64% of the Platreef project through its subsidiary, Ivanplats, and is directing all mine devel- opment work. The South African benefi- ciaries of the approved broad-based black economic empowerment structure have a 26% stake in the project. The remaining 10% is owned by a Japanese consortium of Itochu Corp.; Japan Oil, Gas and Met- als National Corp.; and Japan Gas Corp. The first of Platreef's planned fleet of mobile underground mining equipment, a 5.5-metric ton (mt) load-haul-dump ma- chine (LHD), has arrived on site and will be used for off-shaft station development on the 750-m, 850-m, and 950-m levels. People from Platreef's surrounding host communities are being trained as opera- tors of the LHD. The LHD is the first piece of mecha- nized, mobile equipment to be used un- derground on the Northern Limb of the Bushveld Complex. As underground de- velopment progresses, significantly larger mining equipment, including 14- and 17- mt LHDs and 50-mt haul trucks, will be added to the equipment fleet. Sinking of Shaft 1 will resume after the 750-m station is complete. The shaft is expected to intersect the upper contact of the Flatreef deposit at an approximate shaft depth of 783 m. As shaft sinking ad- vances, two additional shaft stations will be developed at mine-working depths of 850 m and 950 m below surface. The shaft is expected to reach its projected final depth of 980 m below surface in 2019. Current Platreef development is based on a July 2017 definitive feasibility study (DFS) of the first phase of production at an initial mining rate of 4 million mt/y. The DFS estimates initial average annu- al production of 476,000 ounces (oz) of combined platinum, palladium, rhodium, and gold, plus 21 million lb of nickel and 13 million lb of copper. Work on Platreef's Shaft 2 has begun approximately 100 m northeast of Shaft 1. Shaft 2 will have an internal diameter of 10 m and will be sunk to a planned depth of more than 1,104 m below surface. It will be equipped with two 40-mt rock-hoisting skips, with capacity to hoist a total of 6 million mt/y of ore, the single largest hoist- ing capacity at any mine in Africa. The headgear for Shaft 2's permanent hoisting facility was designed by South Af- rica-based Murray & Roberts Cementation. Ivanhoe plans to develop the Platreef mine in three phases to achieve 1) an ini- tial mining rate of 4 million mt/y to es- tablish an operating platform to support future expansions; 2) a doubling of pro- duction to 8 million mt/y; and 3) expan- sion to a final steady-state 12 million mt/y. DRC Puts Mining Industry on Notice The Democratic Republic of Congo is un- likely to roll back its contentious mining code reforms, in spite of vehement ob- jections from the industry. 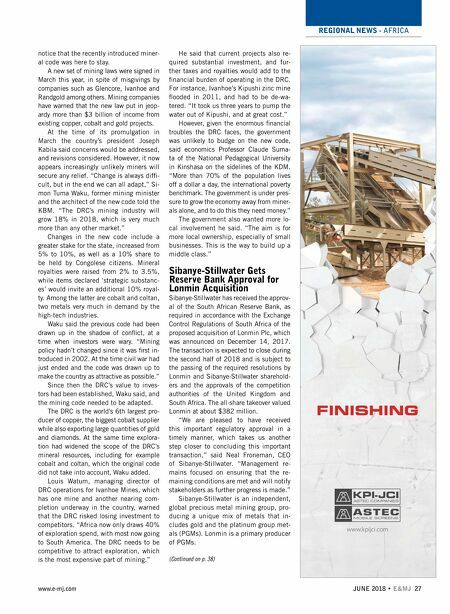 At the recent Katanga Business Meeting (KBM) held in the DRC's second city Lubumbashi, Con- golese officials put the mining industry on A jumbo drill rig is raised up Shaft 1 after the shaft reached a depth of 750 meters below surface. Sinking of Shaft 1 will resume after the 750-meter station is completed.